Find more tips on designing a staircase in our guide, and find out more about lighting a hallway. If you’re designing a staircase, it's important to ensure that you plan your lighting at an early stage. This is particularly important if you want the lights to be unobtrusive, as trimless styles need to be installed before plastering. Another key consideration is fixing points. Whether you’re lighting from above, at tread level or in the wall, factoring the lighting into your plans is really important in achieving the desired effect. 2. Staircase lighting: decorative or functional? Take time to consider whether your staircase lighting is intended for decorative definition or more functional purposes. If it’s the former, be particularly careful not to overdo it. Whilst it's important to ensure that a staircase is sufficiently lit, opting for a solution that's subtle and simple tends to achieve more elegant results. 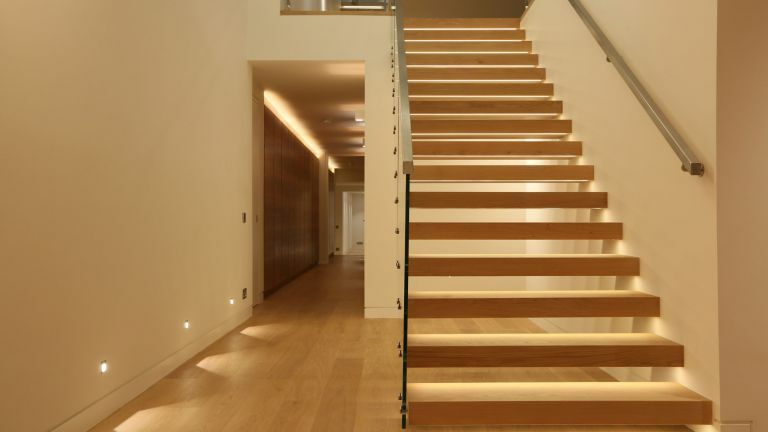 Ideally, staircase lighting solutions should aid the transition from one space to another, so ensure that brightness is similar to the rest of your home. If your staircase has lipped steps, using strip lighting is a subtle and attractive way of illuminating dark staircases that see heavy foot-fall. A little more complex to install, this style may require the assistance of a professional for correct fitting. The final effect is worth the extra effort. A common mistake when installing staircase lighting is to forget the potential glare that will be caused when walking up the stairs. Well-designed marker lights will avoid this by being well recessed into the wall. Illuminating recessed wall spaces is an effective way of creating an attractive design feature while lighting a staircase. Use spotlighting to cast shadows throughout the space and illuminate a simple, stylish feature. We love this example from John Cullen Lighting, where spotlighting is used to illuminate minimalist looking faux-flowers. Are you looking for lighting solutions for open riser staircases? Hiding a contoured LED strip on the underside of a riser means that they remain out of sight when unlit, but create a soft, floating effect when illuminated. The shadows cast below the risers create a subtle and attractive finish. If you have a spiral staircase rather than and open riser you can still light it from beneath to make it even more of a focal point in your hallway . We love how under-lights have been used to create a feature of the underside of this sweeping staircase. If you are after something more decorative than just spot lights and strip lights then instead opt for a few simple wall lights. Pick a design that won't protrude too far from the wall and won't look too much if you have a number of them going up the side of your stairs.